Care Day celebrates, champions and connects the Care Experienced community with each other and those who care about them. A day that originated in Scotland. The first Care Day took place in 2015 to commemorate the one-year anniversary of the Scottish Parliament unanimous passing of the Children and Young People (Scotland) Bill 2014. This was a very significant moment in Who Cares? Scotland’s history as the evidence of 21 brave Care Experienced people helped change the Bill’s course and secure more rights for Care Experienced people in Scotland. Care Day takes place on the third Friday in February each year and has continued to go from strength to strength. 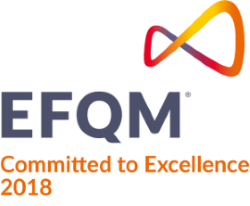 It is now recognised across the UK and internationally as an opportunity to celebrate the lives and voices of Care Experienced people. What does Care Day 2019 aim to do? 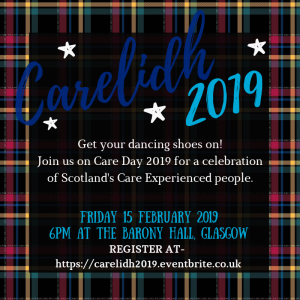 The world’s 4th annual Care Day takes place on Friday 15 February 2019. Celebrate: Shift public attitudes on Care Experienced people’s lives. Connect: Encourage the local, national and global Care Experienced community to engage with our evidence from 40 years of experience of working independently with Care Experienced people. Champion: Connect the Care Experienced community with their allies and corporate parents to talk about how we can ensure Care Experienced people get the love, rights and relationships they deserve. Communicate: Motivate the Care Experienced community, their allies and corporate parents to share their celebrations, show their commitments and ignite discussion. Through celebrating, connecting, championing and communicating, Care Day 2019 will motivate the Care Experienced community, their allies and corporate parents to help love flourish in the lives of all Care Experienced people. Who Cares? Scotland’s vision is to secure a lifetime of equality, respect and love for Care Experienced people. Find out more about how we plan to do this by viewing our strategic plan. We have held voluntary and independent relationships with Care Experienced people for 40 years. We have helped children, young people and adults all across Scotland to share their views, influence decisions made about their lives and feel understood and included in their communities and the world they live their lives in. This Care Day, we will share some of our learning from our 40 years of experience on the lives and rights of Care Experienced people. Care Day 2019 will continue the conversations kick-started by Care Day 2018 and the world’s first ever Lifetime of Love Rally for Care Experienced People, which took place in Glasgow on Friday 26 October 2018. 450+ people took part in this rally. You can find out why it mattered to our Care Experienced community both in Scotland and internationally by checking out Twitter and watching the incredible video below. How can you get involved in Care Day 2019? We will be keeping this page and our Twitter and Facebook up-to-date as more details become available. 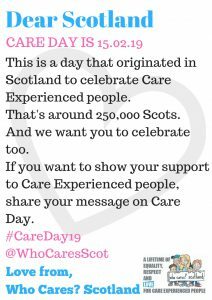 Download your Care Day Celebration message board to share on Care Day 2019. This Care Day, we are calling on people in Scotland’s attitudes to change for the better to help ensure Care Experienced people live a life they love. If you’re not Care Experienced, you can become a friend. Many civic buildings and momuments will light up in red this Care Day. Find out why by clicking here. Register for our Carelidh in Glasgow, which takes place on Care Day from 6pm to 9pm at the Barony Hall, 1 McLeod Street, Glasgow, G4 0RA. Keep your eyes peeled for information from our Membership Team or your local advocate about activities taking place in your area. 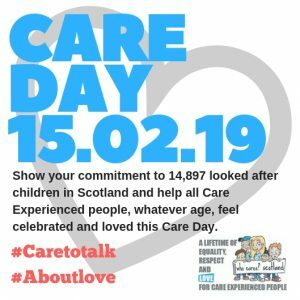 Use social media and the hashtag #careday19 to share your views on the importance of love and how you’re celebrating Care Day 2019. 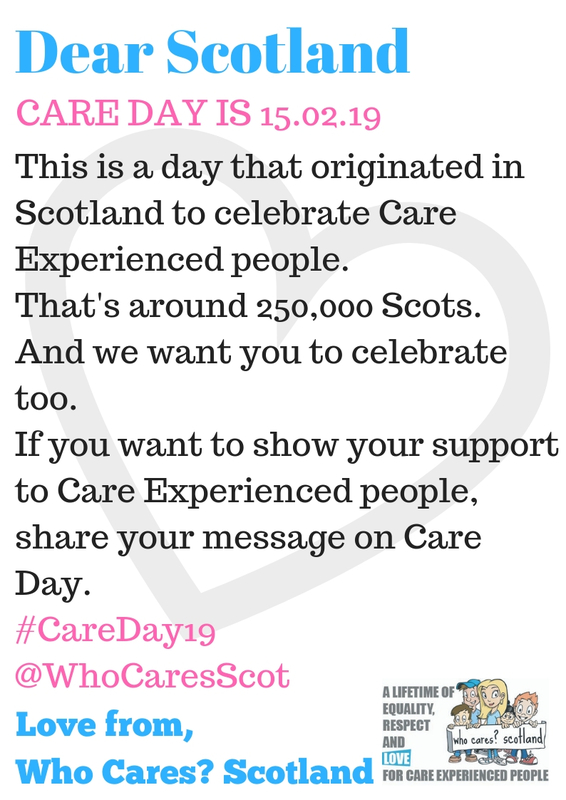 We are delighted you are considering showing your commitment to Care Experienced people by celebrating, connecting, championing and communicating to and with each other and the Care Experienced community this Care Day. Organising an event or activity within your organisation / local authority area. Lighting up your building in pink or red on Care Day 2019 to show some love for the Care Experienced community. Capturing your commitments and share them publicly on social media (using the hashtag #careday19), your website or by working with a journalist or producer to create a media platform. Joining up with our local and national activities. Contact our National Corporate Parenting Team Manager, Chloe Dobson on cdobson@whocaresscotland.org or 07715 312 378. Contact your local Who Cares? Scotland Advocacy and Participation Manager, using the details in the tables below. Talk to Jamie Kinlochan, our Public Affairs Manager, at jkinlochan@whocaresscotland.org or 07786 075 855. Talk to Gavin Sinclair, our Fundraising and Partnerships Manager, at gsinclair@whocaresscotland.org or 07481 033 109.